“The Old Bridge, from which Ivybridge derived its name, bears evidence of age, whether it be the structure of De Ponte Hederae or not, who in some remote period held the Manor. It has but one span and is probably unique in the respect that it is shared by four parishes, unfortunately the spoiling hand of workmen has recently denuded it of its beautiful covering of ivy which gave the bridge such a picturesque appearance”. Of all the landmarks in and around Ivybridge, the most photographed is undoubtedly the old Ivy Bridge, appearing on countless postcards over the years. It has also been the subject for many paintings by artists such as John Inigo Richards, Francis Towne and William Payne. The most famous artist of course being J M W Turner, who visited Ivybridge in 1811 and 1814 making sketches which formed the basis for his watercolour of the bridge. A bridge in this location is recorded as early as 1250. Originally a clapper bridge known as Ponte Ederosa ( the bridge of ivy ), it was built as a packhorse bridge in the 1400s and widened in 1780 for coaches. The bridge may have been built by the Augustian monks from Plympton so that they could reach Dean Prior and Buckfast. These monks were the wealthiest in Devon and the fourth wealthiest order in the country. Other records report that the Peverell family built the bridge. The 17th Century chronicles of Sir William Pole, a Devon historian and antiquarian records that ‘Ivy brigge’ took its name from ‘ye bridge which lieth over ye Erme, being much inclined to ivy’. Each corner of the bridge marked the boundary between the parishes of Cornwood. Harford, Ugborough and Ermington. Until 1894, when Ivybridge was made an Urban Council, the four parishes had some control of Ivybridge. The Ermington and Ugborough boundary markers are still in place but the others are missing suggesting that the northern side of the bridge was extended to make the eleven feet wide bridge we have today. These marker stones also helped to protect the bridge from stage coach wheels. On one of the north-western coping stones a lamp holder can still be seen. In 1992 Tom Maddock, the Town Mayor, looking for new ideas to engage the local community, embarked upon re-enacting the Bridge Ceremony for the following year. 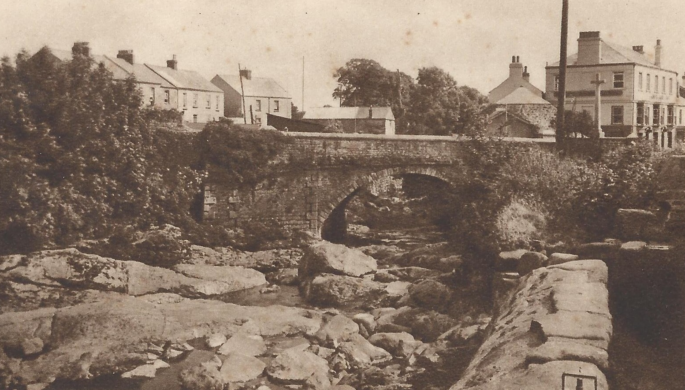 This was a tradition from centuries before when the residents of Ivybridge were asked to pay a fee for the continued use of the Ivy Bridge to cross the River Erme. The fee consisted of a fat duck from the river, some new paper from Stowford Paper Mill and a single red rose. On May 22nd 1993, Tom Maddock recalled the day as being a little dull and wet. However, despite the inclement weather, all the local school children attended, suitably dressed for the occasion. Certificates of appreciation were handed out, signed by the Town Mayor and Deputy Mayor. The first Bridge Ceremony followed on from ‘Beating the Bounds’. The bridge was blocked by a gate festooned in flowers and foliage. A procession of Ivybridge residents paraded to the bridge from Victoria Park to be confronted by the obstruction on the bridge. On the other side were residents of Ermington Parish. 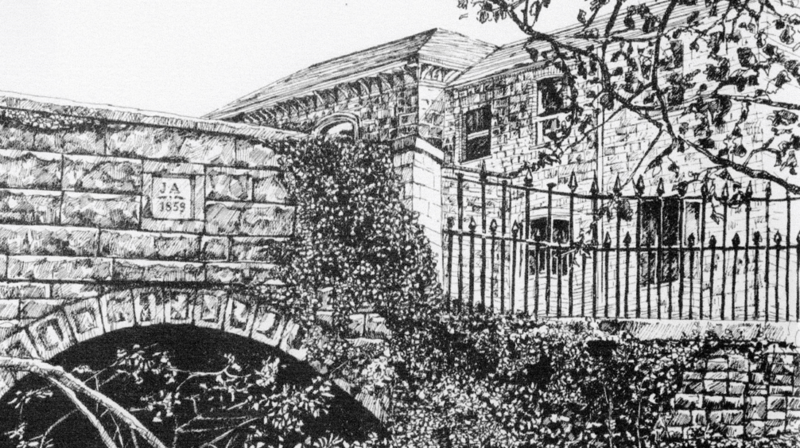 After a brief dialogue between the two and the exchange of a duck, a ream of paper and a red rose, the gate was removed and the residents of Ivybridge were permitted to cross the bridge. All those who helped to organise the ceremony were then asked to sign the ‘Book’, amid much joviality, recording the event for posterity. Following its resounding success and the renewal of an old tradition in Ivybridge, the Bridge Ceremony was planned every year and still forms part of the event calendar today. The new bridge was built in 1834 after several years of planning during the 1820s. The bridge connected Exeter Road to Fore Street and offered a straight route through the village to Plymouth. Prior to the new bridge being built, horses and carriages had to manoeuvre across the old Ivy Bridge. 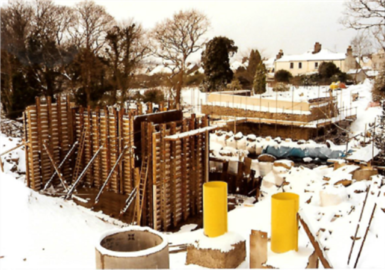 The building of the bridge altered the priority route through the village and subsequently substantial housing and commercial building work took place at the west of the bridge. Today traffic only flows in one direction over the river whilst a separate pedestrian bridge exists alongside it. The bridge was built in 1859 and bears the inscription ‘J.A. 1859’. John Allen, the owner of the paper mill needed good access to his site for receiving coal and raw materials and also to take finished paper to the train station up the road to the north. Previously, despatching paper had involved a complicated route from the mill via the main entrance, over the Ivy Bridge and up to the station goods yard. Factory Bridge, located to the south, provided a route out of Ivybridge linking it to the road to Ermington. The exact date of construction is currently unknown but an engraved stone close to the original site of the bridge documents that it was reconstructed and widened in 1929. This explains its differing appearance in old photographs. This bridge was demolished in 1973 to make way for the new A38 Ivybridge by-pass. Apparently the first detonation failed so a second attempt was required to collapse the bridge. 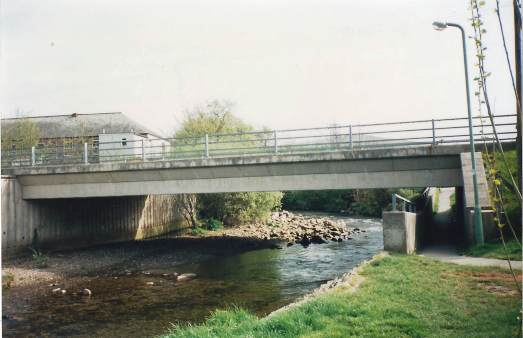 A much later bridge was constructed as part of the Marjorie Kelly Way relief road scheme, enabling this new route to cross the River Erme. 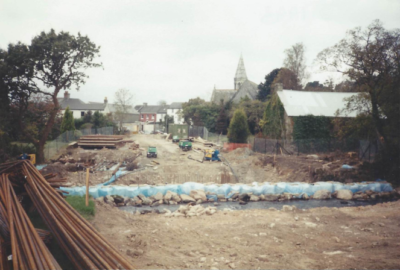 Work commenced in October 1993 with the removal of a number of trees and the establishment of a ‘coffer dam’, constructed from individual 1 ton bags of sand, to control the flow of the river. By January 1994, work was taking place on the buttresses which would support the new bridge, each consuming around 200 tons of concrete. By April, the top sections of the bridge were craned into place and in May the new road was surfaced. 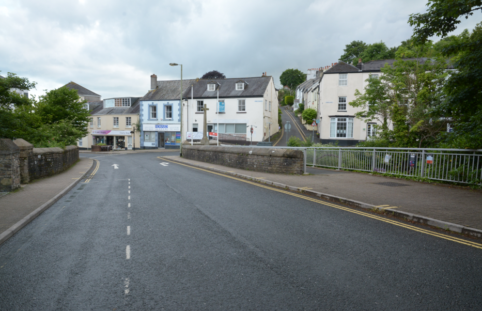 On 13th June 1994 the new Fore Street relief road, Marjorie Kelly Way, was formally opened by Councillor R.G.Ruffle, Chairman of the Highways and Transport Committee of Devon County Council. Marjorie Kelly was a very active member of the local community for decades, particularly with the badminton club which she ran with outstanding success. The road bears her name in recognition of the service and commitment she gave to the town of Ivybridge. Of all the landmarks, buildings and picturesque scenery in and around Ivybridge, the most photographed is undoubtedly the old Ivy Bridge, appearing on countless postcards over the years. It has also been the subject for many paintings by artists such as John Inigo Richards, Francis Towne and William Payne. The most famous artist of course being J M W Turner, who visited Ivybridge in 1811 and 1814 making sketches which formed the basis for his watercolour of the bridge. In 1992, Tom Maddock, the Town Mayor, looking for new ideas to engage the local community, embarked upon re-enacting the Bridge Ceremony for the following year. This was a tradition from centuries before when the residents of Ivybridge were asked to pay a fee for the continued use of the Ivy Bridge to cross the River Erme. The fee consisted of a fat duck from the river, some new paper from Stowford Paper Mill and a single red rose. Ermington: Stop! You cannot cross the bridge. Ermington: Because Lord Peverell of Ermington says so. 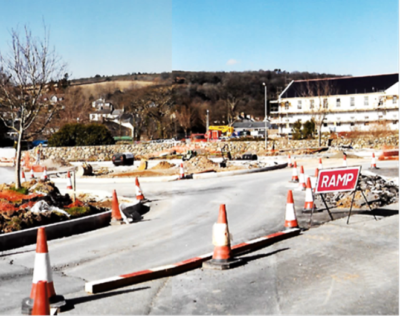 Ivybridge: Remove the gate because we want to go to the village green. Ermington: Then you must pay a token fee first. Ivybridge: How much is that? Ermington: One fat duck from the river Erme, some new paper from the mill and a red rose. 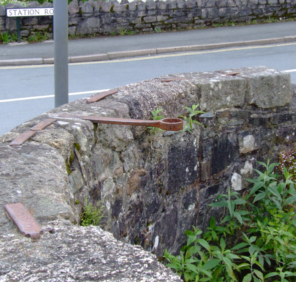 Once the exchange of the duck, ream of paper and red rose occurred, the gate was removed and the residents of Ivybridge were permitted to cross the bridge. All those who helped to organise the ceremony were then asked to sign the ‘Book’, amid much joviality, recording the event for posterity.